Let this exotic stew spice up your dinner routine. 1) In large saucepan, heat 2 tbsp. olive oil. Add onion and sauté a few minutes. Add carrots and sauté a few more minutes. Add garlic, Swiss chard and sweet potato and sauté a few minutes. 2) Add all spices except honey. Saute a few minutes. Stir in chicpeas and raisins. 3) Add vegetable broth and water and simmer about 5 minutes on medium heat. Add honey and stir. Simmer about 5 more minutes. 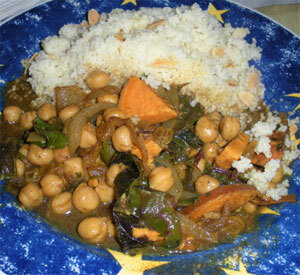 4) Serve with couscous or Basmati rice and garlic naan.